[General description] Buildings on the south eastern corner of Gawler Place and Flinders Street. On the corner stands Fred C. Segar Furniture Showroom, and next door in Flinders Street stands Mitchell's Garage and Auto Repair Service. Stotts Business College is located in the four storeys high building owned by Crompton and Sons next door. On the eastern side of Gawler Place facing north stands Mitchell Auto Repairs Service and Vivian Lewis Motor Repairs. Two young school boys are crossing the street and a lady in a summer dress and wide brimmed hat is crossing Flinders Street. [On back of photograph] Acre 272. South east corner of Gawler Place and Flinders Street. 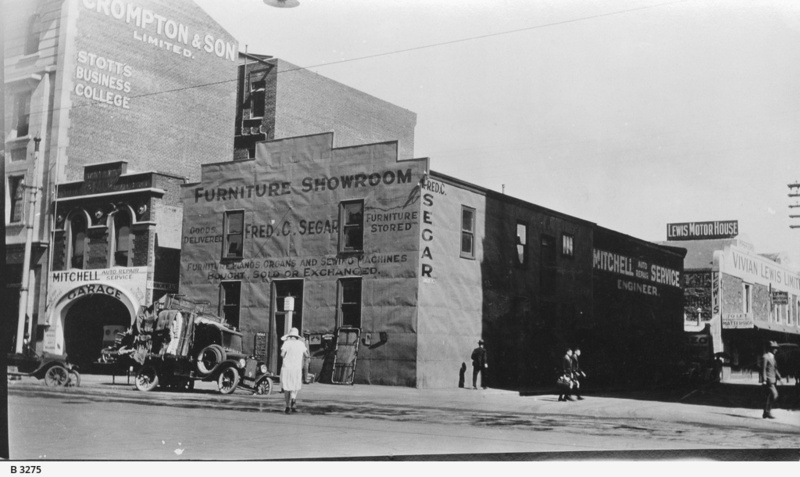 January 25, 1926. . Mitchell's Garage and Segar's premises were demolished in 1926. Compare with B 5128. Segar's frontage: 12 1/2 yards. See duplicate copy herewith for a better print of the Gawler Place frontage.